Christmas trees, brought from the mountain and hillsides, were of all sizes, from two feet high to a majestic height that could graze the lofty ceilings in the decorated homes of the wealthy. The Christmas tree ranged in price from a few cents to more than half a dollar. Most families bought and carried home their tree many days before Christmas eve. Very large trees were difficult to hold in a firm position, but if securely fastened were much more impressive after they were trimmed. 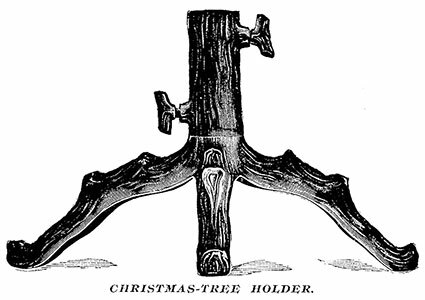 Height, with branches compact to the trunk, was an important matter to be considered in the selection of a Christmas tree, because the weight of the articles ornamenting it always made the branches droop. A little garden or farm made out of paper at the foot of the Christmas tree furnished the children with hours of amusement. They used mosses, minerals, shells and toy animals to make a fine landscape -- with scraps of evergreen for trees and some looking-glass or silver paper for a lake or river. A house on a mossy mound with a few dolls, or woolly sheep and chickens set on the hill, were regarded as a great achievement; as well as a fence manufactured from tiny twigs, or a wall built out of small pieces of stone. 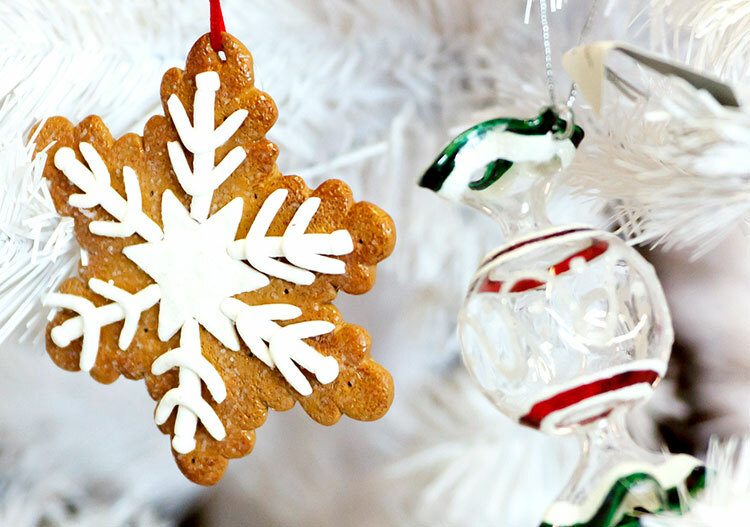 In preparation, evenings before the tree arrived the diligent woman of the house was secretly gilding and silvering nuts and ornaments, making little balloons with fluted sides, and cutting fanciful shapes from colored papers to adorn the Christmas tree. To increase the genuine fun for the fireside, the children were encouraged to manufacture as much of the trimmings as possible. 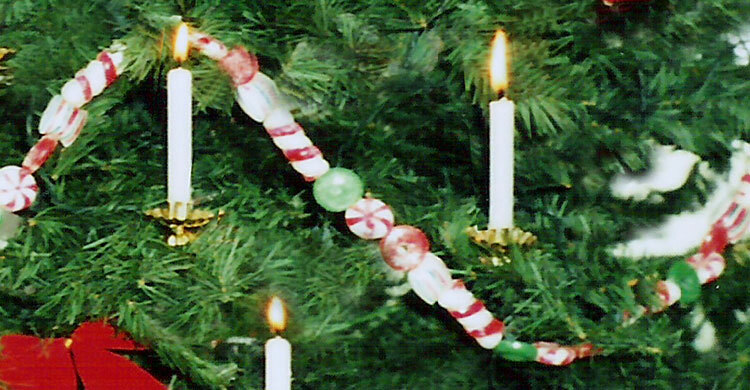 The easiest to make were long paper chains that could be fastened at the top of the tree, and allowed to drop in irregular rows. 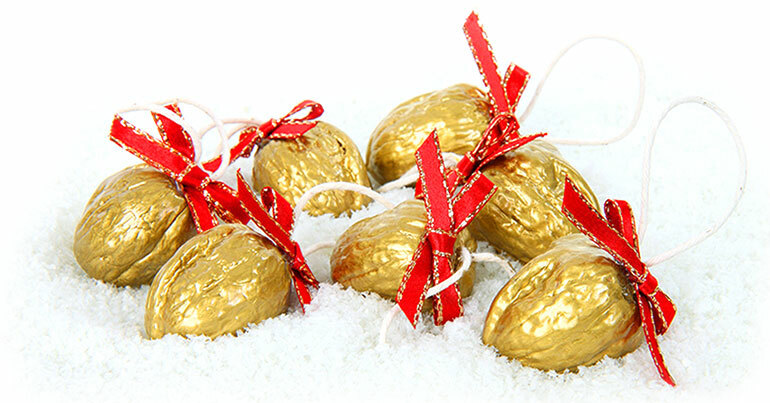 Covered balls with silver glitter trimmed with gold paper. The paper chains were made by taking a long strip of paper, two and a half inches in breadth, and doubling it sharply down the middle; then cutting alternately from each side of the strip, always taking care not to cut quite to the furthest edge of the strip. When the strip was unfolded there would be seen a delicate chain of fragile loops. The paper for this purpose was usually the same tint on both sides. FROM: "CHRISTMAS TREE DECORATIONS, Good to Eat & Good to Look Upon", 1901. Often a variety of fruit was hung upon the branches -- translucent cherries, currants, and berries of each variety with green leaves. Scarlet berries threaded upon cotton, and looped from branch to branch, formed an effective decoration; popcorn of white and red also looked pretty. 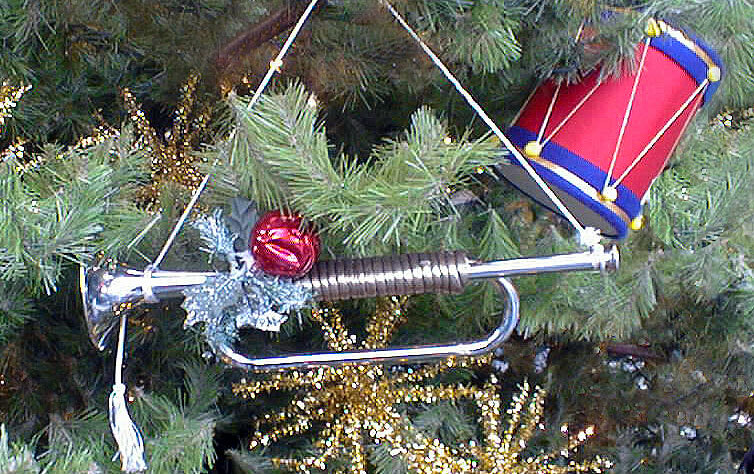 Hard candy tied in squares of colored tissue paper were also hung from the branches of the Christmas tree. 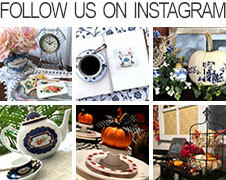 Tiny cakes in fanciful and animal shapes were suspended from every branch. Sometimes a narrow strip of the finest cotton-wool was spread along each branch and twig to the farthest needle-tips, to represent snow, and children were always excited with this addition. Shreds of glittering gilt and silver foil, which would not catch fire, was thrown over the entire tree for a charming effect. At the top of the Christmas tree paper flowers were arranged as their bright colors contrasted favorably with the green branches. At times, roses were placed here and there, in and out. 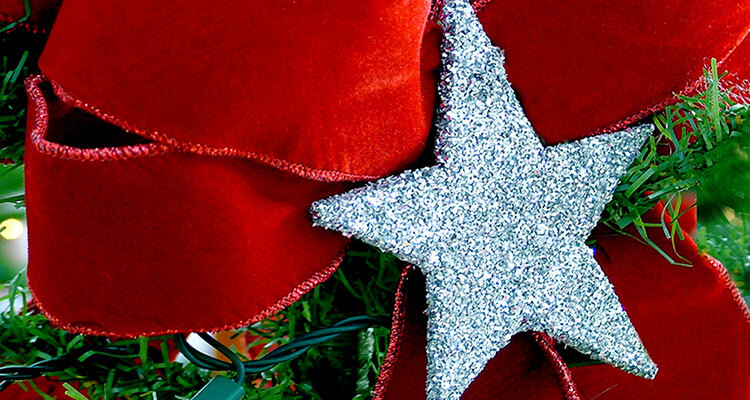 Chain of red stars covered in glitter. 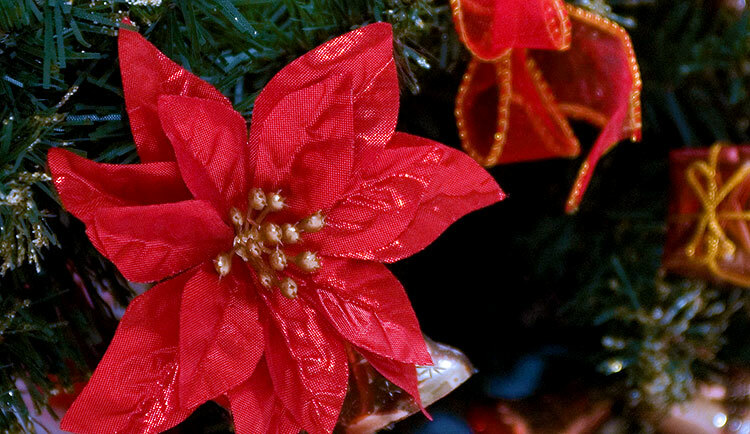 In addition stars, hearts and other shapes were threaded on long strands and draped upon the Christmas tree. They were made of gay colored papers. The design was first cut out of pasteboard and then covered over with fire gilt paper, gold and silver paper, or spangles and tinsel. A pretty effect was produced by covering paper with a coating of gum tragacanth or mucilage, and then sprinkled thickly with diamond dust; this was finely powdered glass. A single star or a chain of stars frosted in this manner over silver paper were very effective for the top of the Christmas tree. Huge diamonds would be represented by a drop of mucilage sprinkled thickly with diamond dust. 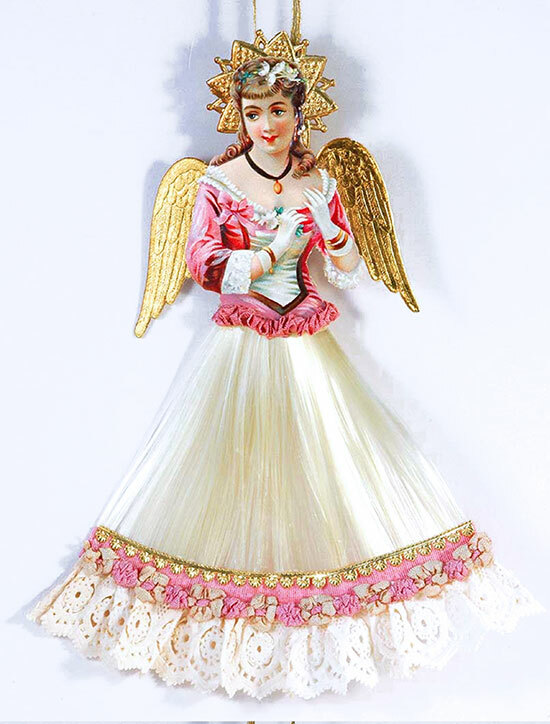 Fairies add greatly to the beauty of the Christmas tree; half length figures were cut out of the colored fashion plates offered in magazines like Godey's and Peterson's. Feet needed to be cut out and added, attached to the back of the skirt. Great ingenuity was exercised in dressing these; tarlatan in varied colors was used for dressing them, and then elaborately trimmed with gold, silver lace and spangles. Innumerable tiny ornaments and trimmings were added to the fairies. Jewels were represented by the different shades of fire gilt paper. A red fire gilt heart pierced by a golden arrow studded with jewels was one design; so was a moon with a profile face. Cornucopias were always pretty, especially when filled with sweets. 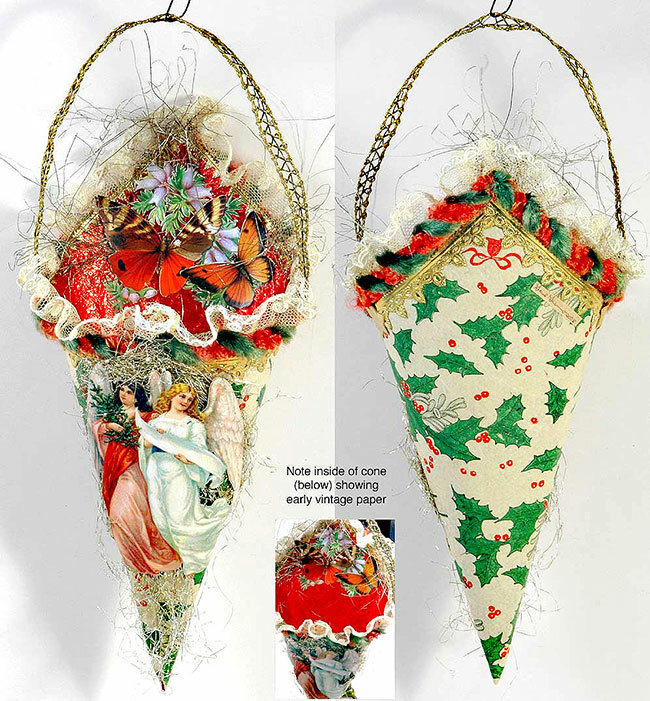 They were easily made out of colored or gilt paper, lined with white paper and bordered with lace paper, or a moss trimming of tissue paper. Gilded walnut shells suspended from colored ribbons looked pretty. The walnuts were covered with gilt paper, or dropped in liquid gold and placed on a board to dry. The two shells were glued together before they were gilded, with the ribbon glued on upon one end. Pine cones were also painted with gold or silver metallic paint (the type used on radiators) and hung from the branches. After the cones were painted and dried, they were tied with bright colored narrow ribbons and attached to the Christmas tree either in groups or separately. Chains of macaroni, painted with the same metallic paint and mixed with colored beads, were another decorative addition to the tree. Acorns bunched together were also an attractive decoration. Then came the tree candleholders -- the most worthy decoration -- whether they were the dozens of elegant polished sockets which supported the pure wax tapers in the Fifth Avenue mansion, or the half dozen twisted bits of tin which the poor woman who worked all day in the factory had carefully saved. 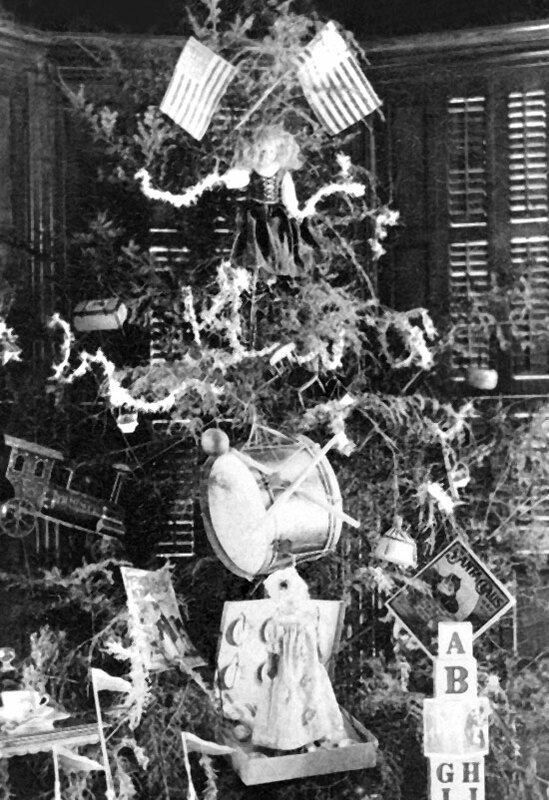 One magazine recommended that a "dignified tree" be decorated with candles only, except for a few gaily wrapped gifts among the branches. The more candles there were, the more beautiful the effect, especially if all the candles were red. Variations were all green candles or a tree of assorted colors. If white candles were used, the tree was sprinkled with artificial snow. 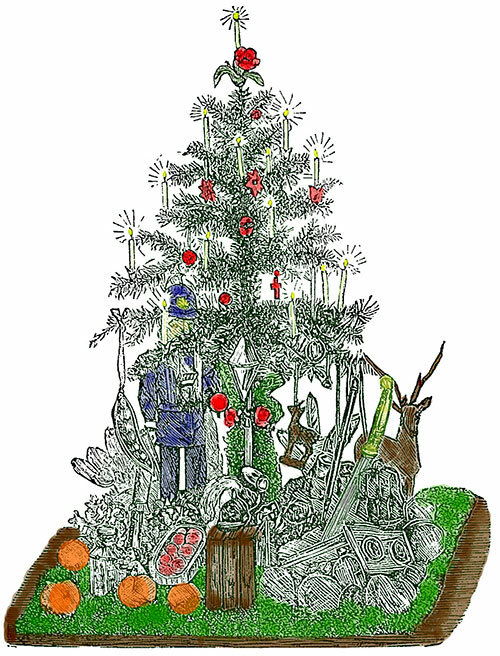 The large gifts that were too heavy to be hung on the tree were usually arranged at the base of the tree, or packed in a hamper hidden from sight by flowers or plants. When the tree was fully decorated, the children went round and round the tree, pointing to each fruit by name, to the tri-colored paper chains and tissue wrapped candy, to the gilded nuts and painted pine cones, to the spirals of tinsel springing with every motion of the boughs, and to the flickering candles in their polished holders -- and laughed delighted if a twig was scorched by a flame and sent out its well-loved pine odor. The Christmas tree decorations were kept from year to year, from generation to generation -- each year some new and special ornaments being added.